OPENING SERVICES, Wednesday May 20th, at 7-30 p.m.
Whit-Sunday, 10-30 and 6-30, by the Vicar. A LOCAL authority states that "Deane Church is the mother Church of Bolton." There are Norman remains hidden under the present fabric, and part of a Norman window is preserved in the Tower. There is record of Churchyard Consecration in 1120 A.D., and the Church would precede that certainly. The Tower is beautifully proportioned to the elevation and length of the nave. It stands, as shown, over a clough of singular beauty, but which the Parish Council want to see obliterated by cinders. The Tower windows are very fine in their way, and the jambs are slotted to carry timbers for resisting attacks. The Tower Arch was bricked up till 1880. 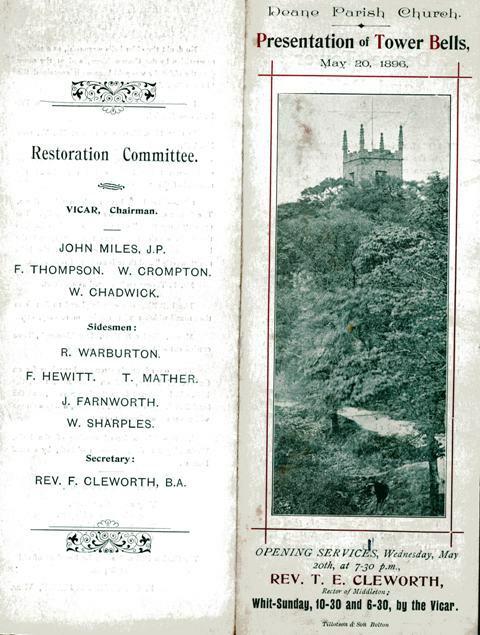 In 1896 it was thought that the time to repair the Tower had arrived. Till 1885 the flue of heating apparatus was carried up inside the Tower, and frequently set fire to the Bell timbers and roof. The Vicar, to prevent this, erected a boiler house outside. Alderman Miles collected the funds for the New Bells. "Richd. Sanders made us six, 1718, A.D."
In 1792 Thos. Meres, London, recast No. IV. Bell, now No. VI. In 1831 Thos. Meres again recast No. V., now No. VII. About 1875 Messrs. Taylor "quartered" or quarter-turned the Bells, which necessitated the removal of the "cannons." 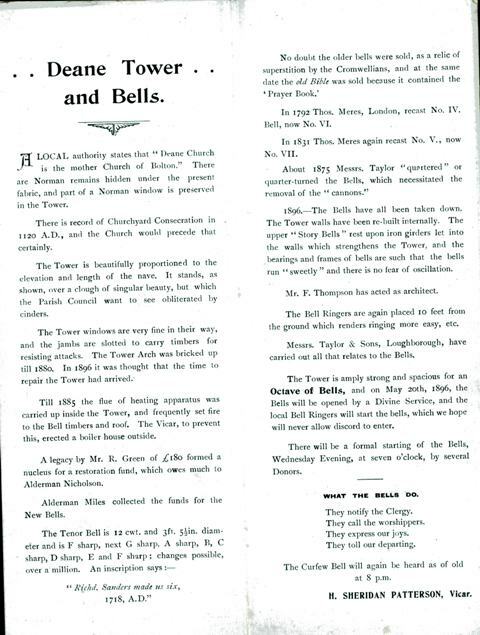 1896.-The Bells have all been taken down. The Tower walls have been re-built internally. The upper "Story Bells" rest upon iron girders let into the walls which strengthens the Tower, and the bearings and frames of bells are such that the bells run "sweetly" and there is no fear of oscillation. Mr. F. Thompson has acted as architect. The Bell Ringers are again placed 10 feet from the ground which renders bell ringing more easy, etc. Messrs. Taylor & Sons, Loughborough, have carried out all that relates to the Bells. The Tower is amply strong and spacious for an Octave of Bells, and on May 20th, 1896, the Bells will be opened by a Divine Service, and the local Bell Ringers will start the bells, which we hope will never allow discord to enter. There will be a formal starting of the Bells, Wednesday Evening, at seven o'clock, by several Donors. The Curfew Bell will again be heard as of old at 8 p.m.